I should be psyched about races, especially new ones, to run in Chicago. And most of the time, I am. I can ride my bike to the start line. I can run a course that's flat and fast (yep, that's pancake flat Chicago for ya). I can run familiar routes. I can roll out of bed to run without stressing too much about having the right layers, the right pre-race foods and the right directions to the start line--and if I don't, it's my fault for not stocking my fridge or shopping for gear. But this time around, I'm psyched about a new race that's happening more than 500 miles away from home. Here's why I'm ready to break my routine and sign up, stat! 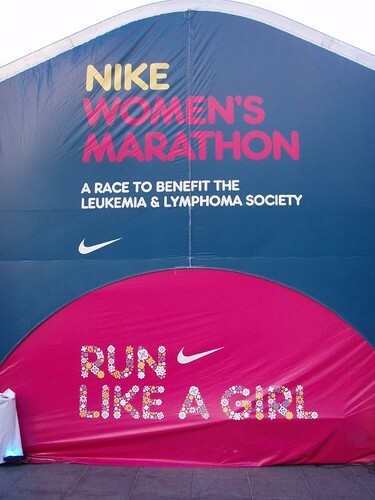 It's the Nike Women's Half Marathon. I've wanted to run the San Francisco race FOR-EV-ER, hills and all, to get that Tiffany bling at the finish line. The race vibe sounds too cool to miss, unless you're religious about running the Chicago Marathon, turn yourself into a total cripple (or expect to) on race day, and know that the only way you could survive San Fran was cheering a friend from the sidelines and having a Segway on call to power up the city's hills. Ahem, that's me. It's in Washington, D.C. I have runner friends and family who live in and around our nation's capital. Surely, I can fire them up to run with me? After all, some of us have been talking about running another race together since 2009. And I've never run in D.C.--not even a training run--so I'm in for a surprising race course. It's in April. After a winter of hibernating (I don't run when it's 7 degrees and blowing snow) and hitting the slopes instead of the trails, this April 28 race is exactly what I need to get me running when the ground thaws. It's open for registration. Nike knows how popular its San Francisco classic is--runners are admitted via a lottery system--so it did the same for its East Coast edition. Registration for the random draw doesn't end until December 6, which means I still have a few weeks to round up some running buddies. And I already have a place to stay (thanks family! ), making it even more worth my while to register. For more details on this new half marathon, go to Nike.com. To register and receive all the training perks, you have to have a Nike+ membership first. But that's the easy part, it's free to sign up and fun to set challenges with others. It's running the half marathon where things can get difficult...if you skip training or lack the mileage underfoot. So...who wants to run with me? Photo grabbed from susanlk74 at flickr.